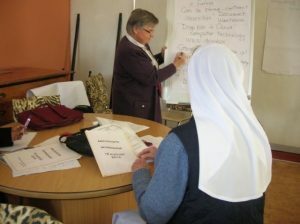 Sr Brigid Rose Tiernan with Mrs Florence Fenn ran the first workshop of this nature we have had. It was well attended and much appreciated. Who is responsible for compiling community annals? What to keep: we suggested – duplicates are destroyed and the best copy of any document / book kept. Who decides what to keep? The archivist has a responsibility here…and some policy is useful for any archives. What to do with ‘gaps’ in information? This is an ongoing challenge for those working in Archives. Different media and forms of information: books, documents, CDs and DVDs, videos, artefacts… We had initial discussions about all of this, and realise we all need more information about digitalisation processes. Storing copies (once information has been captured / scanned into a computer) on an external hard drive, or ‘in the cloud’ (cf www. Dropbox.com) is very important. School Magazines: where to put these? The Archive principle of PROVENANCE is a guide here. What is confidential and needs to be locked away – who has access to confidential information (e.g. Council / Team meeting minutes). We were able to clarify some of these areas for one another. What happens to our Archives in the future? 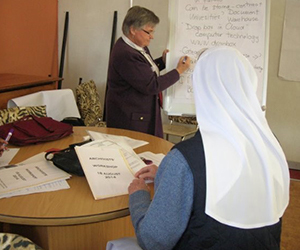 We shared information about some possible options here: with a local University Archives; in a place like Document Wharehouse (Gauteng and KZN)…. 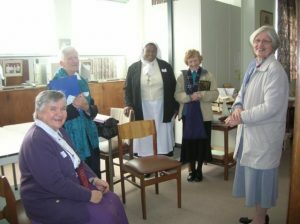 As the workshop was held at St Vincent’s, Melrose, we were able to have an onsite visit two different Congregational Archives, housed here, one very well developed (the King OPs) and one ‘work in progress’ (SNDs). The onsite visits enabled us to see the Data Bases being used, and the different categorisation systems. Acid-free boxes and files, and where to purchase these, were also among the resources shared. The value of ‘dedicated space’ for housing Archive material – and some of us have this already – became obvious, as well as the need for those working in Archives to have the time to do what the work requires. Setting up and maintaining an Archives also requires a budget.